Throughout her career, Hillary Clinton focused her economic plans on creating jobs for the middle class. She's had experience in doing so. She was the First Lady when President Bill Clinton, her husband, created more jobs than any other president. During the 2016 presidential campaign, she proposed five strategies to create jobs. They included tax cuts for middle-income earners, tax increases for the wealthy, infrastructure spending, investment in education, and an increase in the minimum wage. To create jobs, give tax cuts to the middle class and small businesses. Across-the-board income tax cuts, such as the Bush tax cuts, create 4.6 jobs for every $1 million in cuts. Tax cuts for middle-income families work better than for higher income families. That's because they are more likely to spend any additional income, putting it directly into the economy. Higher-income families are more likely to save or invest any tax savings. That helps banks and the stock market but doesn't create economic growth. The nation's measurement, gross domestic product, doesn't include stock market gains as economic output. Tax cuts for small businesses work best if they are payroll tax cuts. The Congressional Budget Office’s study found that payroll tax cuts create 13 new jobs for that same $1 million. The best tax cut goes to companies only when they hire new workers. That creates 18 new jobs for every $1 million spent. Tax cuts create jobs and contribute to short-term economic growth. But this must be balanced later on with decreased spending to prevent the federal debt from increasing. To pay for these initiatives, raise taxes on high-income earners. Ask Congress to tax earnings above $1 million a year at least 30 percent. Impose a 4 percent surcharge on incomes above $5 million a year. That includes capital gains as well as earned income. Restore the Estate Tax to 2009 levels or to 45 percent. Keep the current rate of 20 percent only for assets held for six years or more. Raise taxes to 32 percent for those held three to four years. Raise it to 36 percent for assets held two to three years. Raise it to 39.6 percent for assets held between one and two years. Strengthen the Dodd-Frank Wall Street Reform Act to end the threat from “too-big-to-fail” banks. Levy a risk fee on all banks with more than $50 billion in assets. Impose risk fees banks with high debt levels or too much reliance on short-term funding. Extend the statute of limitations for financial crimes. Require CEOs to personally pay part of any fines levied on their companies. Clinton proposed an "exit tax" on corporations that attempt a so-called "tax inversion." Clinton sought to combat "quarterly capitalism" by raising short-term capital gains taxes. The proposal targets those earning $400,000 or more a year or the top 0.5 percent of taxpayers. Clinton also wanted to impose higher taxes on high-frequency traders. She planned to tax companies that relocated their headquarters overseas to avoid U.S. taxes. Tax increases don't always create jobs. But Clinton's tax increases would have boosted the economy by reducing income inequality. Between 1979 and 2007, the richest 1 percent of American households increased their income by 275 percent. Income for the top fifth rose 65 percent but only increased 18 percent for the bottom fifth. One reason is that many of the wealthiest receive their income from investments. Those capital gains taxes are lower than income taxes. That means they pay a lower tax rate than ordinary workers. For example, hedge fund managers only pay 15 percent because their income is long-term capital gains. Income inequality is one reason why the U.S. economy isn't rebounding as fast as in prior recoveries. High-income households invest, which is why the stock and bond markets are having record years. If low-income households had tripled their earnings, like the top 1 percent did, they would have spent more. That creates more jobs than the stock market does. Clinton would have allocated $27.5 billion annually to a National Infrastructure Plan. It would have improved roads, bridges, public transit, rail, airports, the internet, and water systems. It's one of the four best ways to create jobs, according to a UMass/Amherst study. Researchers found that $1 million spent creates 20 new jobs. The Infrastructure funding would have created 550,000 jobs. It was a proven strategy that helped end the Great Recession in 2009. She would have spent $9 billion on an Energy Plan to repair oil pipelines and reduce greenhouse gas emissions. It could have created 180,000 jobs, as reported by the Republican Party Research’s "The Clinton Tax Hike Plan Revealed." It would also have funded health and retirement plans for coal workers. Clinton supported teachers’ unions and collective bargaining to increase educators’ pay. She would have made community college free. The College Affordability Plan would spend $35 billion a year to refinance student debt. It would also pay states to guarantee tuition. The Expanded Childcare Plan and the Early Education Plan would spend $27.5 billion a year. States could make preschool available to all four-year-olds and expand Early Head Start. Clinton would have also expanded the Individuals with Disabilities Education Act. She would have added $16.6 billion a year to treat children with disabilities. In addition to education, Clinton wanted to strengthen families by emphasizing healthcare and enrichment. Funding for education is the second-best way to create jobs. Each $1 million spent creates almost 18 new jobs. Clinton's plans would have created 112,500 new jobs. Furthermore, these jobs are better paid than those of retail or food service workers. That's because the new positions are also in the education field. As president, Clinton would have askedk Congress to raise the U.S. minimum wage to $15 an hour. She encouraged more plans to increase workers' benefits, expand overtime, and encourage businesses to share profits with employees. She supported unions and collective bargaining to fight wage theft. Those policies would put more money directly into the pockets of lower-income employees. It would boost demand because they are more likely than high-income workers to spend than save or invest. Overall, Clinton supported free trade agreements. She said they are more important than defense in establishing global leadership. Her approach was to develop a comprehensive defense solution that includes diplomacy as much as military might. Clinton opposed the Trans-Pacific Partnership because it didn't go far enough to produce new jobs, raise wages, and protect national security. Clinton had supported the TPP while Secretary of State. She supported the North America Free Trade Agreement and did not oppose the Transatlantic Trade and Investment Partnership. Clinton would combat terrorism with improved intelligence instead of troops. For example, agencies would use social media posts to identify terrorists. Visa applications would require full screenings for those who had traveled to terrorist countries. She approved of hiring more operations officers and linguists in U.S. intelligence agencies. Before announcing her candidacy for president, Clinton used her position with the Clinton Foundation to outline her plans. She emphasized early childhood education and equal pay for women in a June 2013 speech. Clinton also advocated public/private partnerships to promote economic development. One example was the $4.6 million “social impact bond” issued by Goldman Sachs. The firm profits if the program met its goal of reducing the need for remedial education. That meant taxpayers would only pay interest if it worked. Compare Clinton's plan to Donald Trump's Economic Plan. Clinton was Secretary of State in the Obama administration from 2009 to 2013. She lobbied for American companies in foreign countries. Clinton drafted the TPP and pried open Chinese markets to U.S. companies. She lobbied for women's and human rights. She forged major diplomatic breakthroughs with Russia. These were ties since rescinded by Putin. Clinton led the U.S. response to the Arab Spring. Congress and an independent panel investigated her role in the Benghazi attack. According to CNN’s June 28, 2016 report, "Benghazi Panel Caps Two-Year Probe," the panel found that the State Department did not provide adequate security. The attack killed U.S. Ambassador Christopher Stevens and three others on September 11, 2012. Create a balanced budget. Offset any new expenditures with added revenues or spending cuts. Provide health plan tax credits. Expand private plans used by Congress or expand Medicare to all. Create a $50 billion Strategic Energy Fund. Create an alternative energy agency and provide incentives for alternative energy use. Double the size of the enforcement unit in the U.S. Trade Representative's Office. Increase compliance with trade agreements. Expand the Trade Adjustment Assistance agency to help workers displaced by outsourcing. Tax relief including child tax credit, Earned Income Tax Credit, and marriage penalty relief. Reform the Alternative Minimum Tax to protect middle-class earners. Dedicate $8 billion a year to education incentives. Provide a $3,500 tuition tax credit. Allow states' Mortgage Revenue Bond programs to address refinancing. Increase cap by $2.5 billion. Allow Fannie Mae and Freddie Mac to insure jumbo loans. Create the American Retirement Account. It would allow tax-deferred contributions of up to $5,000 per year. The first $1,000 contributed into any retirement account will receive tax credits. Clinton's plan was well thought out and detailed. She was the only 2008 candidate to advocate a balanced budget. The tax credit, health insurance, and retirement plans would have funneled cash to consumers. That's the most direct way to jumpstart the economy. Her proposals would have increased the power of existing agencies without increasing federal spending. Her retirement plan would have addressed the looming Social Security crisis. The Alternative Minimum Tax has been a problem long overdue. Her proposal to fix this platform would have benefited the U.S. economy. A $30 billion housing crisis fund to help local governments prevent foreclosures. A 90-day moratorium on foreclosures. A rate freeze on subprime mortgages until banks converted them into affordable loans. More power to state housing financing agencies to help families refinance. Increased portfolio caps at Fannie Mae and Freddie Mac. $25 billion in emergency home heating assistance. $5 billion for various energy efficiency measures. $10 billion in extra unemployment insurance. $40 billion in tax rebates if the economy worsens. Convene the Working Group on Financial Markets, coordinating with regulators around the world. Provide relief for mortgage holders. Liberalize the 2005 bankruptcy law. Clinton was the U.S. Senator from New York from 2000 to 2008. She served on many Congressional committees. These included Armed Services, Budget, and Aging committees. 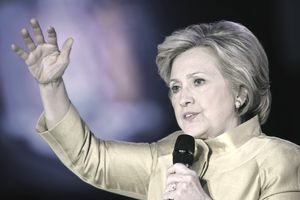 Clinton served the Commission on Security and Cooperation in Europe. She worked across party lines to expand economic opportunity and access to health care. After 9/11, Clinton supported funding to rebuild New York. That included addressing the health concerns of the first responders at Ground Zero. She fought for better healthcare and benefits for wounded service members. That included veterans and the National Guard and Reserves. Hillary was President Bill Clinton's ​First Lady from 1993 to 2001. She was Chair of the Task Force on National Healthcare Reform. It created ​The Health Security Act of 1993. In 1995, she helped create the Department of Justice's Office on Violence Against Women. In 1997, she supported the passage of the State Children's Health Insurance Program. SCHIP expanded health insurance for children in lower-income families. She helped pass the Adoption and Safe Families Act. ASFA made it easier to remove children from abusive situations. There are 14 accomplishments that Hillary has done, all centered around health care, family, women, children, and the military. Secretary Clinton graduated with a B.A. from Wellesley College in 1969 and a J.D. from Yale Law School in 1973. She was an assistant professor at the University of Arkansas School of Law and worked for the Rose Law firm. In 1977, President Carter appointed her to chair the Legal Services Corporation board. She was First Lady of the State of Arkansas from 1979 to 1981 and from 1983 to 1992. During that time, she chaired the Arkansas Education Standards Committee. She also co-founded the Arkansas Advocates for Children and Families. Clinton served on the boards of the Arkansas Children's Hospital and the Children's Defense Fund.